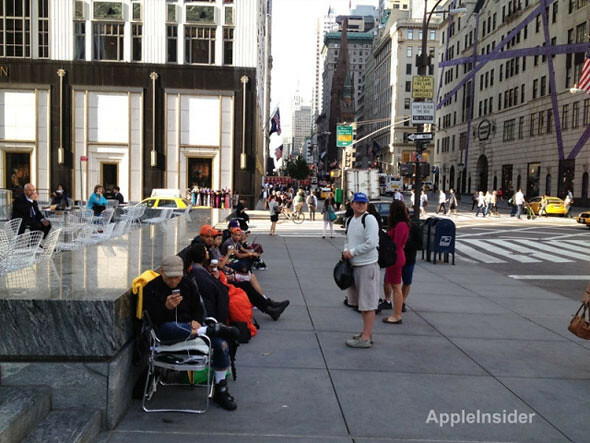 Ahead of launch, the queue for the iPhone 5 at the flagship in Fifth Ave Apple Store, New York has already started. In fact, 4 days earlier. The queue started with 7 people, each with a business purpose. Then it become 10. This should have been expected since Apple recently reported that their pre-orders of the iPhone 5 topped 2 million in just 24 hours, more than double the previous record of one million held by iPhone 4S. 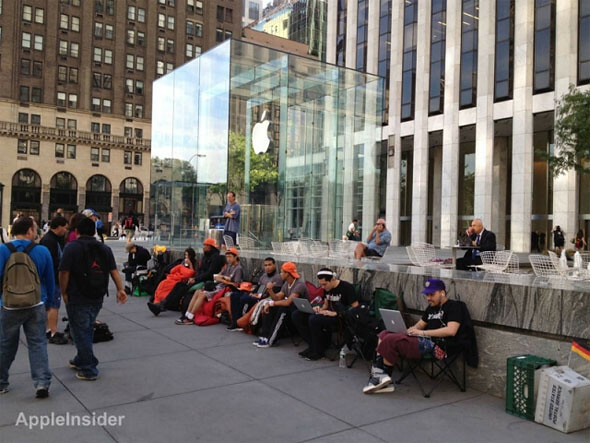 “iPhone 5 pre-orders have shattered the previous record held by iPhone 4S and the customer response to iPhone 5 has been phenomenal,” said Philip Schiller. The first two in line are Hazem Sayed, 54, and his marketing manager Sage, 31, who started the line on Thursday at 8 a.m. — eight days early — to promote their social media startup called Vibe. Jessica Mellow, 27, and Keenen Thompson, 22, are third and fourth in line. Mellow is blogging about her experience this week at iphonewhatever.com. Keenen is the assistant to a Conde Nast fashion writer. Their wait is being sponsored by Gazell who is providing food, drink, camp chairs, sleeping bags, Gazelle-branded t-shirts, sweatshirts, hats, wrist bands, and, in case of rain, a tent.